White Supremacist Hero or Thug? 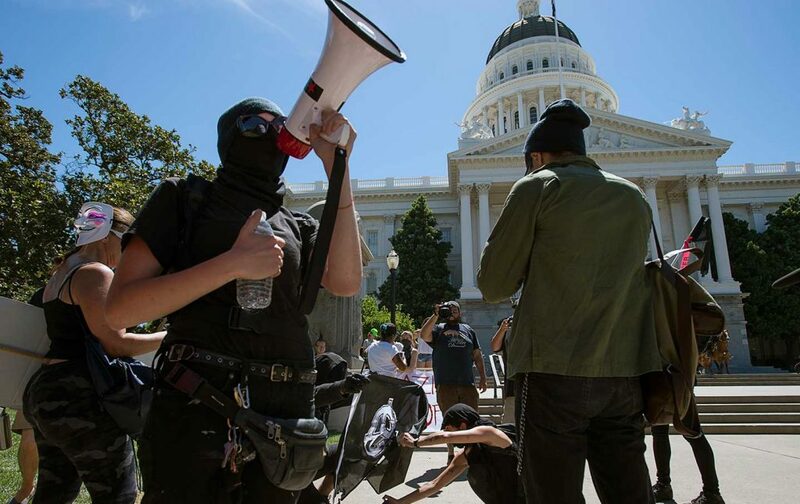 SACRAMENTO – Hero or thug? Avowed white supremacist William Planer may get the chance to tell the jury which one in his Sacramento County Superior Court trial here Tuesday – Planer is accused of felony assault of an anti-fascist protestor at riot on June 26, 2016 that left seven hospitalized and even more injured when anti-fascists and white supremacists clashed at the State Capitol. The prosecution rested its case Monday, and Planer’s defense opens Tuesday. Whether Planer testifies or not – his lawyers would not say for sure Monday – another white supremacist will take the stand for Planer’s defense, but only after off and on legal wrangling away from the prying eyes and ears of the jury Monday. Eventually, out of earshot of the jury, the defense won the right to present a surprise witness, Sean Wurzburg, who was at the melee with Planer nearly three years ago. While Deputy District Attorney Casey Sinclair argued he shouldn’t be allowed to testy, defense counsel Jem Martin strongly disagreed. “There has not been any evidence of the severity of the attack on the Traditionalist Workers Party and allies,” said Martin, noting that California Highway Patrol officer Donovan Ayers didn’t see the attacks. “Sean was there. He witnessed it, was attacked and saw Antifa (anti-fascists) trying to bust their heads. “He has more to offer (than Ayers). The jury needs to know it was self-defense by Mr. Planer. This is necessary,” Martin insisted, coaxing Wurzburg to explain that TWP had shields because “you knew they were violent.” Wurzburg, indeed, said that rocks and bricks were thrown at about 20 TWP marching in lockstep, 2 x 2 in formation to the Capitol’s South side. DDA Sinclair countered that Sean “was busy with his own situation…He offers nothing. I don’t know the relevance.” Wurzburg was busy as the bloody clash began. Wurzburg testified he was pepper sprayed, and hit with a 2×4 piece of wood, a baseball bat and flag pole. Judge Stacy Boulware Eurie ruled at day’s end Monday that “I will allow limited testimony as to describing what happened to him.” She then warmed attorney Martin “don’t use” the “busting heads” language again. Earlier, Martin scored points in his contention that Planer was a hero, defending not only himself, but others in his group – outnumbered by about 200 to 20. He emphasized that Planer was temporarily blinded, most likely, by “bear mace,” which is stronger, said CHP officer Donovan Ayes, than regular pepper spray. “It’s designed to take a bear out isn’t it?” said Martin, who described the effects of the spray included is a “fight or flight” reaction. And, Planer was unable to see well, and surrounded by scores of hostile and armed counter protestors, defended his friends and himself by a large stick he had taken from an anti-fascist protestor attacking him. DDA Sinclair tried to explain all of this way, but the video of the incident – with a pepper spray cloud enveloping Planer – showed, at least, that Planer was heavily hit by the chemical. And, although effected, Planer would turn, as the same video showed, and hit anti-fascist protestor Alice Summers in the back of the head, and then move to help other TWP people as they were attacked. “Antifa just keeps coming and coming,” said Martin. Even when TWP and Planer retreat, “it doesn’t end for TWP until they all leave the Capitol,” he added. Still, the prosecution left little doubt that it was Planer who thuggishly assaulted counter protestor Alice Summers, who was knocked unconscious when she was hit in the back by a pole-swinging Planer just as she was on her knees after being knocked down earlier. She later was hospitalized. In a series of photographs (prosecution exhibit #13) clipped from a video of the Capitol battle, a large tattoo was clearly seen on the person slamming Summers to the ground. And that same tattoo was obvious in a jailhouse photo of Planer. The two matched. The pole that Planer used to smash Summers was seen much shorter just minutes later as he repeatedly hit another anti-fascist protestor just feet from where Summers was sprawled unconscious on the south Capitol lawn. Ayers said that latter fight resulted in Planer’s weapon breaking in half, so he was left with only part of it in his right hand. Ayers shed some light on law enforcement’s work that day, although they’ve been heavily criticized by observers, news media and lawmakers for not doing enough to prevent the violence at the Capitol. Ayers, on cross from defense counsel Martin, estimated the number of CHP, Sacramento City Police, Sacramento County Sheriff Deputies, and probation employees to be in the range of “100 to 150.” Although he testified earlier than only 40-50 law enforcement were on scene. Ayers also said – but didn’t go into much detail – that there had been numerous meetings between different law enforcement agencies about that day and the “high” possibility of violence, specifically from, he noted, the anti-fascists groups not the TWP. “Did they (TWP) have to fight their way out?” asked Martin. Planer, according to Ayers, was hit by pepper spray from the anti-fascists just seconds before he hit Summers with a pole. Ayers acknowledged that pepper spray can cause confusion and temporary seeing difficulty. “She (Summers) did take up a fighting position” when the anti-fascists group ran to the south side of the Capitol…there was a lot of screaming. I couldn’t tell if she said anything,” said Ayers in response to Martin’s inquiries. He added that Summer was near the front of the crowd that initially confronted the TWP and allies, explaining that she was knocked to the ground in an initial fight and then struck by Planer, and knocked out less than a minute later. Martin, who continued to refer to the anti-fascist group not as counter protestors but “the disrupters,” asked Ayers if the TWP and allies were defending themselves “from a larger group.” Ayers said “Yes. There were the first fights, and then a pause and then the protestors (anti-fascists) re-engaged” until the TWP yelled “retreat” and went back to N Street. Martin repeatedly tried to get into evidence that anti-fascists groups had armed themselves, but the judge sustained the objections of DDA Sinclair to not allow it. Although the judge earlier seemingly did allow Ayers’ testimony about that to come into evidence – Ayers said the counter-protestors had poles, sticks and peppery spray.